hangers, a photo by a1scrapmetal on Flickr. Found at Blakemere. Two packs for £5. 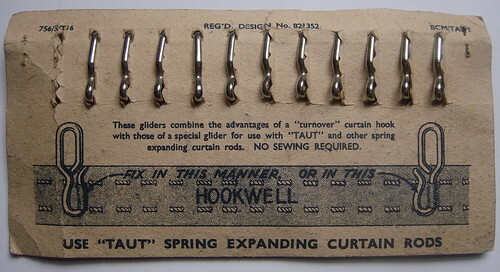 SPECIALLY DESIGNED FOR USE WITH HOOKWELL PLEATING TAPE." I remember having this wire on my bedroom window as a child...The sample piece of wire attached is a stroke of genius. Only four and a half old pence...change from a sixpence. hangers 2, a photo by a1scrapmetal on Flickr. 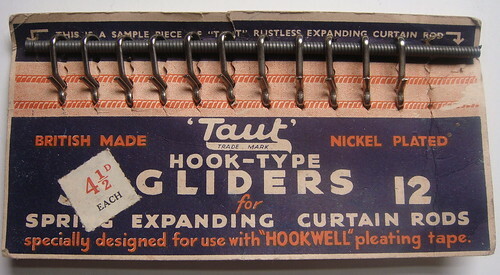 "These gliders combine the advantages of a "turnover" curtain hook with those of a special glider for use with "TAUT" and other spring expanding curtain rods. NO SEWING REQUIRED." bits missing, a photo by a1scrapmetal on Flickr. Bought from two steam rallies, one at Kelsall and one at Daresbury. Both have bits missing. 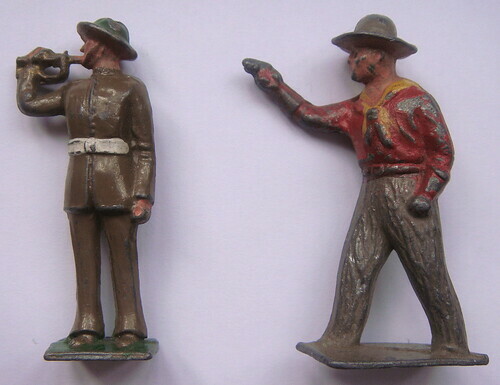 Both were bought from the same stall holder..I should have bought the soldier the first time!